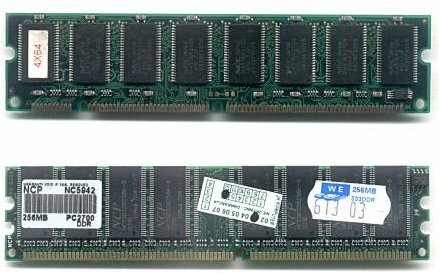 DDR3 and DDR4, with the latest generation (DDR4) released in the second half of 2014. DRAM chips. They run at 133 MHz (7.5 ns clock period) and have 8-bit wide data buses. CKE Clock Enable. When this signal is low, the chip behaves as if the clock has stopped. No commands are interpreted and command latency times do not elapse. The state of other control lines is not relevant. The effect of this signal is actually delayed by one clock cycle. That is, the current clock cycle proceeds as usual, but the following clock cycle is ignored, except for testing the CKE input again. Normal operations resume on the rising edge of the clock after the one where CKE is sampled high.Put another way, all other chip operations are timed relative to the rising edge of a masked clock. The masked clock is the logical AND of the input clock and the state of the CKE signal during the previous rising edge of the input clock. CS Chip Select. When this signal is high, the chip ignores all other inputs (except for CKE), and acts as if a NOP command is received. DQM Data Mask. (The letter Q appears because, following digital logic conventions, the data lines are known as "DQ" lines.) When high, these signals suppress data I/O. When accompanying write data, the data is not actually written to the DRAM. When asserted high two cycles before a read cycle, the read data is not output from the chip. There is one DQM line per 8 bits on a x16 memory chip or DIMM. RAS Row Address Strobe. Despite the name, this is not a strobe, but rather simply a command bit. Along with CAS and WE, this selects one of 8 commands. CAS Column Address Strobe. Despite the name, this is not a strobe, but rather simply a command bit. Along with RAS and WE, this selects one of 8 commands. WE Write enable. Along with RAS and CAS, this selects one of 8 commands. This generally distinguishes read-like commands from write-like commands. L H H L x x x Burst Terminate: stop a burst read or burst write in progress. L H L H bank L column Read: Read a burst of data from the currently active row. L H L H bank H column Read with auto precharge: As above, and precharge (close row) when done. L H L L bank L column Write: Write a burst of data to the currently active row. L H L L bank H column Write with auto precharge: As above, and precharge (close row) when done. L L H H bank row Active (activate): open a row for Read and Write commands. L L H L bank L x Precharge: Deactivate (close) the current row of selected bank. L L H L x H x Precharge all: Deactivate (close) the current row of all banks. L L L H x x x Auto refresh: Refresh one row of each bank, using an internal counter. All banks must be precharged. DDR3 and DDR4 use A12 during read and write command to indicate "burst chop", half-length data transfer DDR4 changes the encoding of the Activate command. A new signal ACT controls it, during which the other control lines are used as row address bits 16, 15 and 14. When ACT is high, other commands are the same as above. DRAM standards add additional mode registers, addressed using the bank address pins. For SDR SDRAM, the bank address pins and address lines A10 and above are ignored, but should be zero during a mode register write. The bits are M9 through M0, presented on address lines A9 through A0 during a load mode register cycle. M9: Write burst mode. If 0, writes use the read burst length and mode. If 1, all writes are non-burst (single location). M8, M7: Operating mode. Reserved, and must be 00. M6, M5, M4: CAS latency. Generally only 010 (CL2) and 011 (CL3) are legal. Specifies the number of cycles between a read command and data output from the chip. The chip has a fundamental limit on this value in nanoseconds; during initialization, the memory controller must use its knowledge of the clock frequency to translate that limit into cycles. M3: Burst type. 0 - requests sequential burst ordering, while 1 requests interleaved burst ordering. M2, M1, M0: Burst length. Values of 000, 001, 010 and 011 specify a burst size of 1, 2, 4 or 8 words, respectively. Each read (and write, if M9 is 0) will perform that many accesses, unless interrupted by a burst stop or other command. A value of 111 specifies a full-row burst. The burst will continue until interrupted. Full-row bursts are only permitted with the sequential burst type. DRAM System Design Constraints and Considerations, a master thesis from the University of Maryland.